Clean the cauliflower florets and shallow fry it in 2 tbsp oil till golden brown and keep it aside. Heat little oil in a pan and splutter cumin seeds. Add chopped onions and saute well till transparent. Add ginger-garlic paste and fry for 2 minutes in medium flame. Add kashmiri chilli powder, coriander powder, cumin powder, turmeric powder and garam masala and saute for 2-3 minutes in medium flame. Add chopped tomato and salt and saute well till it becomes soft and mushy. 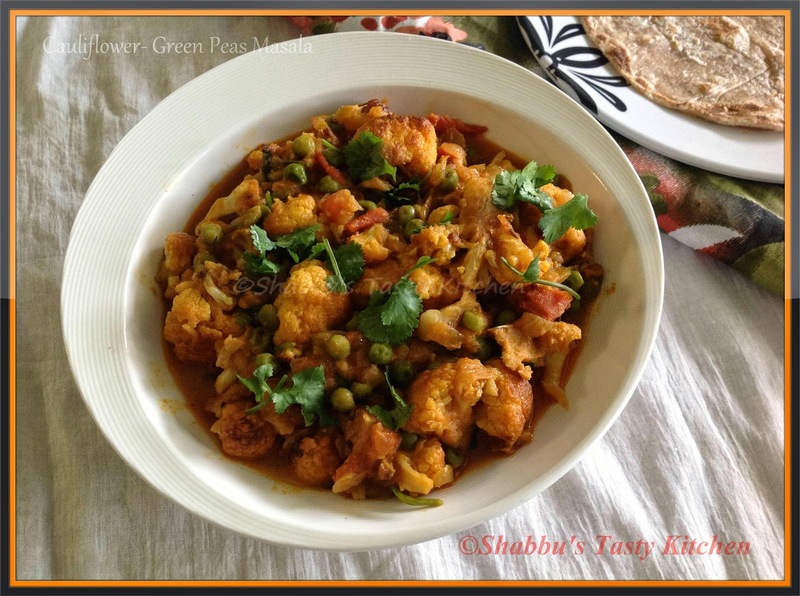 Add cauliflower florets and green peas and mix it well for 2 minutes. Then add water and mix well and cook covered in medium flame until cauliflower and green peas are cooked. who doesn't love those masala with fresh and hot chappathis..